Global Visitor Management Software market is expected to reach USD 6300.0 million by 2025 & is expected to exhibit CAGR of around 17.3% between 2017 and 2025. Visitor Management Software can be defined as a paperless register for maintaining a track record of all the visits and visitor data into any organization at any point in time. Usually, such type of software is used in several sectors like BFSI, Healthcare & Life sciences, IT & Telecom, Retail, Government & Public Sector, Aerospace & Defense, Education, and several other sectors. Visitor management software not only provides the movement of the visitors or employees in any given workplace but also provides real-time data of the visitors. The global visitor management software market was valued at around USD 1200.0 million in the year 2015 and it is expected to reach approximately USD 6300.0 million by 2025. 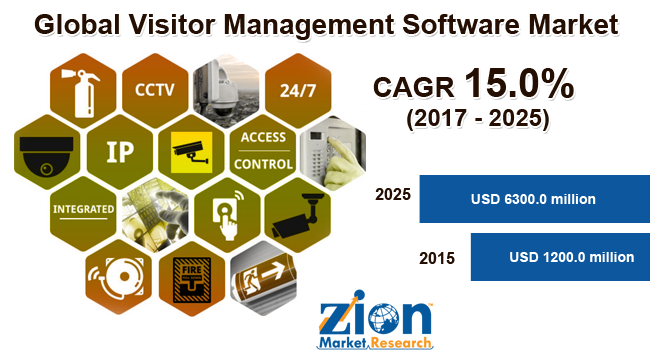 The global visitor management software market is expected to exhibit a CAGR of more than 15.0% between 2017 and 2025. The major factor driving the growth of visitor management software market is the need for paperless administration in several organizations owing to ease of maintaining data. Moreover, stringent government regulations and policies by associations in maintaining the visitor data records are likely to drive the growth of the market over the forecast period. The regulatory scenario in the developed regions like North America and Europe is quite organized. Rising awareness regarding the different safety measures and systems at the workplace and other governmental offices have increased the sales of the visitor management software. The high cost of visitor management software and slow progress in customer adaptation is expected to arrest the growth of this industry in the years to come. The Professional services sector is dominating the visitor management software market by service type. The increasing number of IT projects outsourcing owing to the rapid urbanization triggers the growth of the market. Also, the increase in the number of third-party vendors for security systems and administration has further cemented the dominance of professional services in the visitor management software market. The Professional service is likely to reach USD 2992.4 million at a global front. The Port security sector is dominating the visitor management software market by application type followed by Public safety and security. The intense security and strict regulation at the port security make the segment the most dominating in the application type segment. Further, the need for public security at several public and professional places renders high usage of visitor management software. On a global front, Government and Public sector hold the maximum share in the visitor management software market by vertical segment. The government and public sector hold market share of 18.7% in 2016. The growing safety and security concerns in such sector are due to confidential data maintained by the government and public companies which needs to be protected. North America contributes a market share of 36.8% 2016 and is likely to grow at a CAGR of 17.2% from 2017 till 2025. The factors responsible for such a high market share are high importance to strengthen safety and security of the work premises and stringent government regulation. Asia Pacific region is likely to grow at a higher CAGR over the forecast period. The countries in the Asia Pacific like Japan and other developed countries hold the highest market share of the Asia Pacific visitor management software market. The report includes detailed profiles of the prominent market players that are trending in the market. The list of the players that are compiled in the report is Alert Enterprise, AppGear Ltd., BALANCE & UNIQUE Inc., Building Intelligence Inc., Envoy Genetec Inc., among others. The prominent market players maintain the competitive edge in the global market by making investments in the mergers and acquisitions and by increasing their product portfolio. In August 2015, Quantum Secure was acquired by HID Global, an ASSA ABLOY Group Brand.